The costume turned out really cute and was a big hit! I saw the idea in Parents magazine years ago, and knew that if I ever had a baby I would remember it for their first Halloween. My mom and I made the orange fish pillow and the green seaweed sash. She did the sewing and I painted the white lines on the fish (instead of using tape like the instructions suggest). 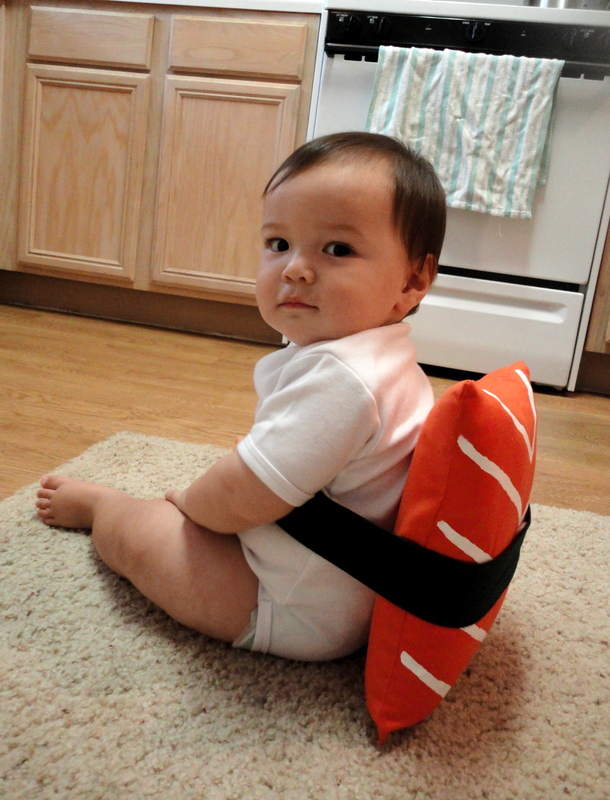 The rice part of the sushi is just a regular white onesie. He wore it to his library play group on the 30th, and on Halloween we visited my mom’s school where there was a little Halloween parade with all the kids wearing their costumes. He crawled around and played like normal, not seeming to notice the pillow on his back for more than a moment, and never tried to pull it off.